You are going to fall in love with this Keto Sausage Ball Recipe. It’s so easy to make, full of flavor, and keto-friendly. A perfect recipe for using as an appetizer or even as a fast breakfast. This one is kid-friendly and delicious! My husband loves sausage balls, but the ones I normally make are full of carbs. So, as a special keto surprise, I’ve been working on creating the perfect keto Sausage Ball Recipe. Most of the ones I’ve tried have been extremely dry, like give me a gallon of water right now before I can take another bite dry. So, I started experimenting from scratch to see if I could create a recipe that was both moist and flavorful. My first try, in my opinion, was a total thumbs down. 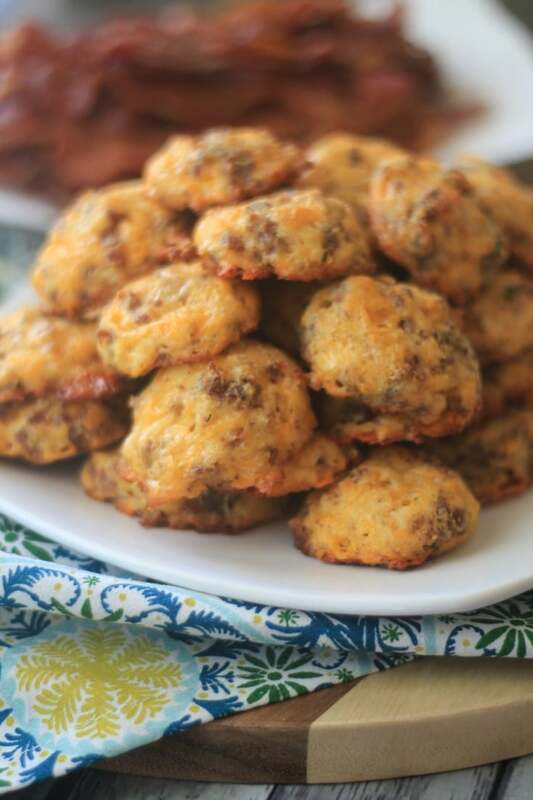 Then, I remembered my delicious keto biscuit recipe and how amazing it tastes. I thought I might be able to tweak that recipe to make sausage balls that would knock my husband’s socks off. Since you can’t really roll the dough into actual balls because of the moisture content, I decided to call these Sausage Ball Puffs. In actuality, they are much easier to make because you don’t have to spend time rolling. 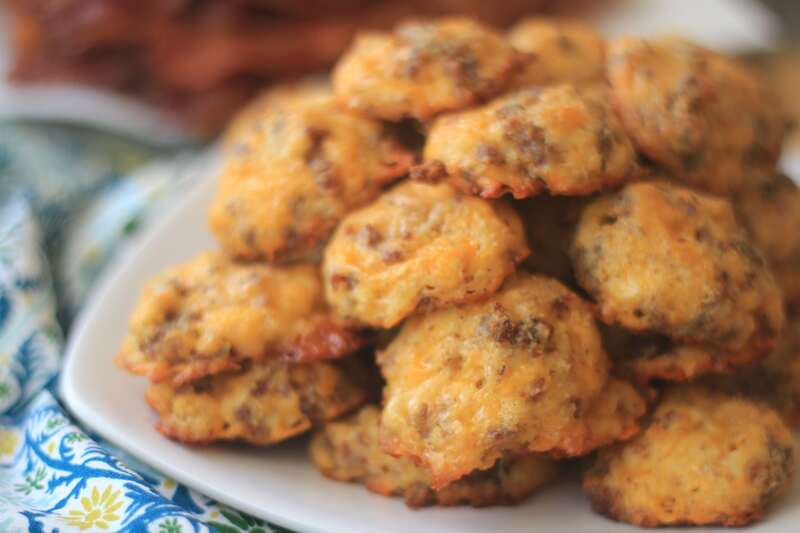 If you don’t love sausage, or want to try some variety, check out my Low Carb Cheesy Bacon Bites. I’ve gotten several questions about substituting almond flour for coconut flour. We have tree nut allergies in our family, so I don’t personally cook with almond flour. Therefore, I haven’t tried using almond flour in any of my recipes. Generally, 1/4 cup coconut flour equals 1 cup almond flour. Since you aren’t rolling these out like more traditional sausage balls, I recommend using a cookie scoop. It is super fast and works perfectly for this recipe. Plus cleanup is much easier than using your hands to roll them into balls. You are going to fall in love with this Keto Sausage Ball Recipe. It's so easy to make, full of flavor, and keto-friendly. A perfect recipe for using as an appetizer or even as a fast breakfast. Drop batter by tightly packed spoonfuls on greased cookie sheet. I made 36. Bake for 15-18 minutes or until tops are slightly brown. Make our delicious sausage ball recipe as a perfect make-ahead option for breakfast or an appetizer everyone will enjoy. This is such an easy recipe to follow, you’ll be amazed at how simple it is to make. 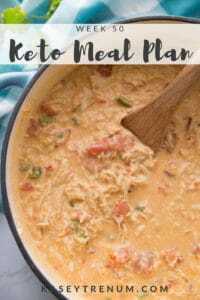 If you want to try more great recipes like this one, check out my Keto Recipe Index. Some of our favorite recipes are listed below! These make perfect appetizers for your next party. The best part? Nobody will realize they are keto friendly! « Lodge Cast Iron Square Grill Pan – PRICE DROP! I’m sure they could be frozen. I would say no longer than 3 days in the refrigerator. I freeze mine all the time. Not sure how long they’ll last in there because we use them up pretty quickly. Thanks for the feedback Joanna. I would say the same for us. I can’t keep them in the freezer long because my family eats them so quickly. How do you reheat from the fridge?. I pop them in the microwave for a few seconds then put them in the air fryer to crisp them up. That would be incorrect. The nutritional information is provided at the bottom of the recipe card. They are less than 1 carb each. Is serving size 1 of 36? Awesone recioe. Thank you!!! The serving size is up to you. I provided the nutritional information per sausage ball puff so that each person could determine their own serving size. The nutritional information provided is per sausage ball puff so that each person can determine their own serving size. I pop them in the microwave for a few seconds then into the air-fryer to crisp them up. Is this nutritional info per puff? Why would you cook the sausage, first? I know some recipes don’t call for cooked sausage, but that’s how I’ve always eaten them. Otherwise, I don’t feel like the sausage gets done enough. But, if you’d rather not, you could definitely try not cooking it first. I don’t think the cook time would be sufficient to cook the sausage properly, especially with all the added ingredients. Also, i think it would be pretty difficult to incorporate raw ground sausage into these. As the recipe calls for the sausage to be drained, this prevents a soggy glutinous lump to try cooking, if you use raw sausage then you won’t be able to drain it and won’t get that nice puff and even cooking !! Yes, that is per piece. That way no matter how many someone ate, they could figure out the macros. I uploaded the recipe in MyFitnessPal free version. In the diary, you can copy and paste the url of a recipe and it will import the recipe and figure out the macros. How exactly do I find this on MyFitnessPal? I put in the URL and got other people’s recipe. You said to go under “diary” but then what?? Thanks! 8. Then you have to look at each ingredient as you may have to modify as sometimes it pulls something crazy. That was very kind of you to step by step the instructions on how to do that. It took me a minute to figure it out too. This recipe looks so yummy…can’t wait to try it! Thanks for posting it!!! Sure! Glad it was helpful. I did not know you could be this! I’m so excited! Makes it so much easier!! Sausage pluffs were awesome! Thanks so much! Thank you for posting the steps for fitness pal. I never knew you could do this and I’ve been using my fitness pal for a while now!! Thanks for sharing this AWESOME info!! how do I find this in cronometer for my macros? I don’t know I have never used cronometer. The macros are provided for this recipe at the bottom of the recipe box. You may have to add it manually. The nutritional information is provided per sausage ball puff so all you would need to do is multiply that information by how many you eat. Could you use almond flour for these? I’m sure you could, however, coconut flour and almond flour are not a 1:1 ration to substitute. I am not sure how much you would need to add. I made half batch with 2/3 c almond flour and turned out wonderful! I substituted 1 cup almond flour and a half teaspoon of xantham gum for the coconut flour. Also, I chilled them before baking in the fridge for 5 minutes. They turned out very well. Perfect! Glad you enjoyed them. How does this change the carb count per serving? I had the same question about almond flour. My daughter is allergic to coconut. I saw that Chris made a half batch with 2/3 c almond flour. If I wanted to make a full batch, do you think it would turn out if I Doubled the amount of almond flour? Thanks! I haven’t used almond flour because my daughter is allergic to almonds. The substitution is approx 1:4. 1/4 cup coconut flour to 1 cup almond flour but you may have to play around with the recipe. You could just leave out or use cream cheese. It adds a little extra moisture to the recipe. I realized mid-recipe we were out of sour cream. I used 2 Tbsp it whipped cream cheese and had to use an immersion blender to mix it well, but they turned out great! Sure! Glad you enjoyed them! Did anyone try freezing them yet? If so how did you reheat them? We did and they froze perfectly! I reheated some in our air fryer, while others I popped in the microwave for a few seconds, then wrapped in aluminum foil and put in the oven for a few minutes until they crisped back up. These are awesome and.my husband enjoyed them as well. By far, this recipe is as close to my original high carb sausage ball recipe as any I have tried so far. These are better than any almond flour version. I am actually eating them in place of a sausage biscuit, that I can’t eat anymore on a low carb diet, and am fully satisfied with the flavor and texture. That is fantastic! Thanks so much for taking the time to comment. I’m so glad you enjoyed them. Cook first and then freeze or freeze and then bake? I’m sure you could do it either way, but I’ve only cooked first then put in the freezer. Ok so I cooked these exactly to recipe and they ended up basically all melting together…where did I go wrong? I did use fresh shredded extra sharp cheddar. Other than that I followed exactly what the recipe said. Hmmmmmm…….perhaps it was the extra sharp cheddar, I’m not sure. You may have needed to drain the sausage a little longer too. You can try chilling the dough next time for a few minutes before cooking. That happened to me the first time I made them and then I realized I didn’t press them together firmly. They’ve been perfect ever since. I cook mine in a small muffin pan for the best results. Or you can use a regular muffin pan. That way they don’t spread out on the bottom. I think that is a great idea. Mine spread out too but they still tasted yummy. Do we need to take the casing off the sausage and crumble it? Thanks! I used breakfast sausage so there is no casing. Do you think these would do well in a muffin tin? Absolutely yummy!!! Very moist and so goooood, trying it out with different kinds of sausages, thanks for the recipe! I just made this recipe. It turned out great. I have been eyeballing it ever since I stumbled across it. I decided to make it into large puffs. I used my bagel and muffin trays they worked like a charm. I am super excite about how they turned out. Hubs said they look good. I am cooling them and freezing for later. So yummy! I made a big batch of these and thought they would be our breakfast for the week. They were gone the next day. Now I’m making much bigger batches and I keep them in the fridge. So easy to pop a couple in the microwave on the way out the door for a delicious breakfast. Thank you so much for this delicious recipe! Fantastic! I’m so glad you enjoyed them. Thanks so much for taking the time to comment. I just made these. I thought they were very tasty and easy to make. Kudos! These look great. Since the sausage is already cooked, do you think these could be made in a babycakes maker? I’ve not used one of those before so I can’t say for sure but it’s worth a try. Let me know how they turn out. These are so good! 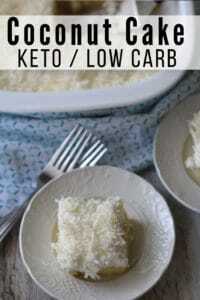 I just started the keto diet and was wondering about the food… so far I have tried 3 recipes and its so good! Thank you, thank you, thank you!! This was my first “baking” recipe since starting keto, and I’m ecstatic. Breakfast sandwiches are my favorite, and these cover that craving easily! I made them without browning the sausage first and they worked just fine. Also, double thanks for the instructions on how to import recipes from websites into MFP! You made my day! Just made these and wowzer!!! They are oh so yummy!!!! Thanks Kasey!!! Sure! So glad you enjoyed them. Thank you! Your recipes are so easy to follow and so delicious. Everything that I’ve made has been a hit, you are awesome Kasey! Thank you so much, Cara! I so appreciate your kind words and encouragment. So excited to try this recipe! 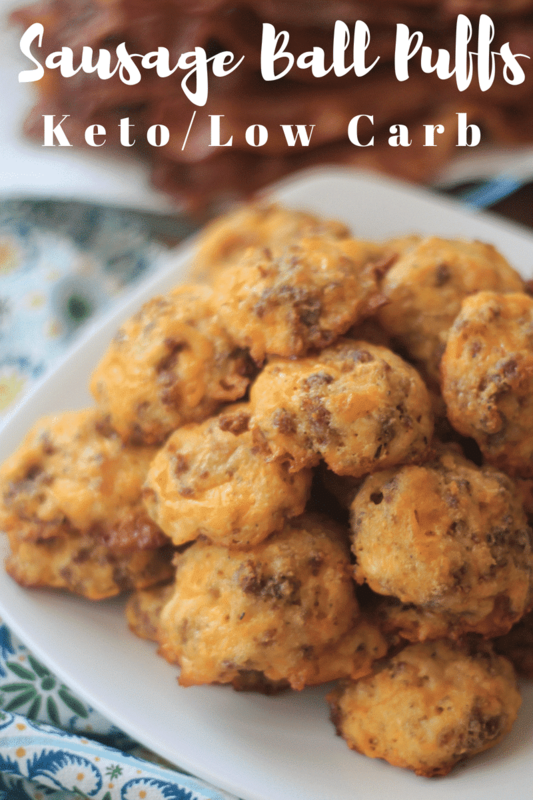 Sausage balls are a holiday staple at my house and I was wondering if it was possible to do them keto style. Thanks for figuring it out! ? I have never had a sausage ball before (which might be a good thing because I have nothing to compare it to). I’m going to try this recipe. But I was wondering, what do you serve with it, normally? You can eat with eggs at breakfast or many times it is served with various other appetizers as a snack type food. What coconut flour do you use? I’ve used various brands and they have all worked great. We’ve just started the Keto diet, and Kasey’s recipes have made this whole process so much easier. My whole family loves these sausage puffs. They truly taste so much like sausage balls that I used to make with Bisquik! We can be very picky, so I was really surprised by how much we liked them….and how soon I had to make another batch. It really is so helpful to have a batch of these made for a good, easy, quick breakfast or snack. Could this be put in a baking dish and baked as a casserole type breakfast? I have only tried it as written but that sounds like a great idea. Made them for the first time today and subbed in chorizo because I had a craving for it. A bit too greasy for it… lol. Still has great taste and just needed to put them on a baking rack after the first ten minutes to let grease drain from them. I’ll definitely make them again but will use regular sausage to cut back on the grease. Cannot wait to try other recipes you have (I am only on week two…). Yea, I wouldn’t think that chorizo would work great. Keep pressing on. You are doing a great job! These sound yummy! If I wanted to up the fat a little for my meal without increasing the protein, would cream cheese, plain or maybe seasoned a little, be something you might suggest as a spread on the puffs? Or would you or someone reading this have a better idea? Thanks! I’ve been Keto for awhile now and just found your website with all of your amazing recipes. Last Night I made this one and it made 2 pans mini muffin size. I added some sauteed chopped mushrooms and 2 T of spicy mustard to the 2nd batch that went in the oven. I also used 1 cp of almond flour instead of the coconut flour. I have to say – THIS was one amazing recipe and my roommate and I LOVED them!! I just wanted to say KUDOS to you – and I will be trying more of your recipes! Thank you for a great website and the mouthwatering recipes! Awesome! Your tweaks sound like a great idea. Thanks so much for your kind words of encouragement. Is it 89 calories per sausage ball? I’m wanting to make these soon, but wasn’t sure if it was per ball or not. No worries! Yes, the nutritional info is based on each sausage ball so that each individual could determine their own serving size easily. If you were to have these for lunch about how many puff balls would you eat? Thank you for this recipe. These are amazingly yummy and easy to make. I made a big batch and froze them. I take a few out when I want to eat and they reheat beautifully in the microwave. So glad you enjoyed it. Great idea! These are delicious as is. This morning I made them and substituted garlic salt for salt. I also added chives and garlic powder, then brushed the top with melted butter and a garlic mix. Next level delicousness was achieved! OMG, these are really good. My husband who usually turns his nose up towards the keto foods I cook, came into the kitchen asking why the kitchen smelled so good. When he saw the puffs on the counter, he ate them without asking what it was and he is really liked it. These are really good, I have 1/2 of them in the freezer and the remaining in the fridge for this week. thank you. Yay! So glad he loved them. That is a huge win. These are absolutely delicious! I just made them for my keto sweetheart and we may have to store them in the freezer so they don’t all get eaten in one day. I’m so glad you both enjoyed them. What size cookie scoop did out use? My recipe ended up being 30 puffs due to the size of my scooper. Why are the macros different do you think? Perhaps because the macros provided in the recipe are based on 36 maybe? I have a professional nutritional plugin that calculates macros automatically. Of course it could also depend on the exact ingredients you used compared to what I used. I made these tonight for my family. They turned out really well. I will say that I thought it was easier to scoop them out after the mixture had been refrigerated for a bit. We have recently been trying to go grain free for my 2 year old daughter, and these were approved by the hubs and daughter both. #MomWin Thank you for the recipe! Thank you so much! Unfortunately, this happens often. They add one additional ingredient or change up the instructions and they can claim it as “their” recipe. It is very frustrating. I don’t know what I did wrong but these came onto flat 🙁 They still taste good…oh and I made the mistake of putting foil on the cookie sheet with spray, half of them stuck to the foil…Bummer. Your butter may have still been too warm or your baking powder was old. Next time try keeping the batter in the fridge a little longer. I would suggest using parchment paper. 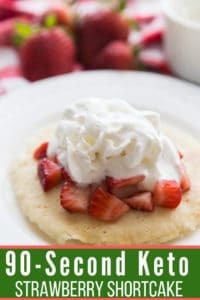 Keto friendly flours are very sticky and tend to stick unless you use parchment paper. These are AMAZING!!! Thank you so much for this recipe! I’m so glad you loved them. You are so very welcome. I grew up eating sausage balls with bisquick and used to eat them with my oatmeal. Two days ago I was craving them and was going to see if there were any keto recipes. I forgot to look them up and these came up on my IG. I just made them. Although not as pretty as yours, (didn’t have an ice cream scoop) they are very good. You do all the hard work figuring these recipes out and it is very appreciated. Thank you! Awesome! So glad you loved them. I appreciate your kind words of support and encouragement. Just made these for breakfast meal prep and they are delicious! It’s important that you squish the mixture together tight or it will flatten while baking. I used parchment paper and they did not stick to pan. I may add a little garglic powder or parsley for a little more flavor next time but my husband loves them so I will definitely have to make them again! Awesome! Glad you and your hubby liked them! These are amazing! So glad I found them. Quick and easy breakfast! I’m so glad you loved them. Kasey, my question is on serving size. I’m confused by the 1×4 for servings. Is it 1 sausage ball per or 4 per? Thanks for all your recipes. They are great!! Nutritional info is per sausage ball so you can determine your own serving size. Would like to try in my air fryer. Any suggestions on temperature and cooking time? I only use the air fryer when reheating the left-over sausage balls. Made them today, so good! How do you store them? I totally forgot the cheese until they were in the oven (so I added a little slice to each top) and they still turned out great! I used natural turkey sausage instead of pork to up the protein:fat ratio and lower calories a bit because these are mainly for my kiddos. The coconut flour flavor is pretty prominent (without the cheese, mind you), so I may try almond flour next time. Definitely a keeper of a recipe! These would be awesome as an appetizer or party snack, too. Thanks for your perfect recipes (we love the pumpkin cheesecake muffins as well, and can’t wait to try more), Kasey! I feel like I did something wrong. Everyone says theirs came out moist, but mine were dry ? Still delicious, though! And I agree with a previous poster, coconut flavor is prominent so keep that in mind if you’re making them! You may have needed more cheese? Measuring grated cheese can vary from person to person as mine has never been dry in the least. If you are sensitive to the taste of coconut flour, you can sub almond flour but you’ll need 4x as much. I have these in the oven and can’t wait to try them! When you serve them after freezing them, do you reheat them or serve at room temp? Thank you! I reheat them in my air fryer. Just made these – delicious! Thanks for the recipe.
! I substituted 4 ounces of cream cheese instead of the sour cream. I was hesitant to use coconut flour because I don’t likr coconut but I used it and there was no coconut flavor that I could taste! This is by far the best Keto sausage breakfast item I have made so far!! Thanks so much!!! I made these for the first time and my family absolutely loves them! One tip i have is if you have a mini muffin pan, you can just fill each slot with the mix and they come out like bite size muffins instead of having to roll them into balls. These were really tasty . Used 1cup of almond flour. Regular ice cream scooper (that’s all I had) and cooked for 18 minutes. Thank you for a yummy recipe Kasey. Fantastic! So glad you love them. Hi what’s a good brand of Keto sausage to use for this recipe? Most breakfast sausage should work. Look at the ingredients and avoid sugar if possible. I just found your website, and I must say it encouraged me! 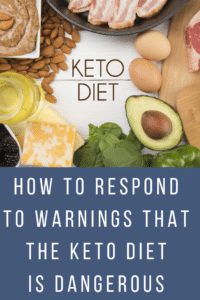 I want to try the Keto diet as I need to lose some weight due to some health issues. However, so many of the recipes I’ve seen call for things that our small town grocery store doesn’t carry, or things that we don’t normally like. Your recipes look great! I can’t wait to try them. I’ve already felt like the protein was going to be a problem because I wasn’t sure how to fix it, and plain jane roasted or boiled chicken, etc. gets pretty tiring. I also have a son that will try about anything, and a 10 year old that doesn’t want to try anything new. Hubby doesn’t like poultry! These recipes look great, though! Awesome! I’m so glad that my website encouraged you! I don’t have sour cream handy, is there a substitute or js it possible I could still make them without it? 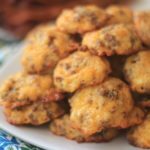 This recipe was followed to a T, however as they baked, they flattened considerably and look more like an oozy mess than delectable puffs! ? Any reason why this would happen?? Your butter may have still been too hot. Just made these this morning, WOW, amazing! Used hot sausage and they turned out great. Thanks this is the first I have made a recipe using nut flower that I can say I really like. 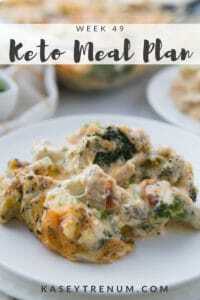 just started Keto 2 weeks ago and just trying to find really good recipes that the family would like and this is one for sure! I usually go for the breakfast sausage that has the lowest carbs.